1. What is the Magazine Gift Program? 2. What is the Loyalty LabelTM? It’s a 4” X 4” non-removable label applied directly on the front cover of every issue. The Loyalty LabelTM displays your contact information, logo and a personal message. Click here to review the document and learn more about custom logo option. Minimum purchase may be required for custom designed label. Please contact us to learn more. 3. What is the Announcement Postcard? A 6”X9” postcard is automatically sent via First-Class Mail® on your behalf to announce your personalized gift subscription and to ask for referrals. Custom artwork and copy are available. Please contact us for details. 4. What is the Gift Selection Card? You may mail or personally present a hard copy of the Gift Selection Card to your clients and have them choose their preferred magazine. 5. What magazines do you offer? The magazines offered in the Magazine Gift Program are Better Homes and Gardens, Car and Driver, Cosmopolitan , Country Living, D Magazine, Dwell, Eating Well, Elle, Elle Decor, Esquire, Field & Stream, Food Network, Garden & Gun, Good Housekeeping, HGTV, House Beautiful, Kiplinger, Men's Health, Midwest Living, New Jersey Monthly, O, The Oprah Magazine, Parents, Phoenix Home & Garden, Popular Mechanics, Popular Science, Portland Monthly, Road & Track, Saveur, Seattle Met, Shape, Town & Country, Traditional Home, Veranda, Washingtonian, Woman's Day, and Working Mother. 6. How much does everything cost? The cost is $22 when ordered one at a time and paid by credit card, any magazine of your choice. Quantity discounts are available. Visit "Pre-Pay&Save“ to learn more. You can save money and time by purchasing an inventory of prepaid order codes. Think of them as electronic gift certificates or credits that you purchase to use at any time over the next year. One prepaid code is automatically applied at checkout to “pay” for a personalized gift subscription, any magazine of your choice. 8. How do I order a personalized gift subscription? Sign in to your account and go to “Place An Order”. If you don’t have an account, please create one before placing orders. Order online and pay by credit card. If your order is for 20 or more subscriptions at one time, you may download the Order Form. Complete and return to dawson@ctwo.net. We will contact you for payment once we receive your file. 9. What is the order schedule? Please allow 8-12 weeks for receipt of the first issue. *Based upon magazines that are published each month. 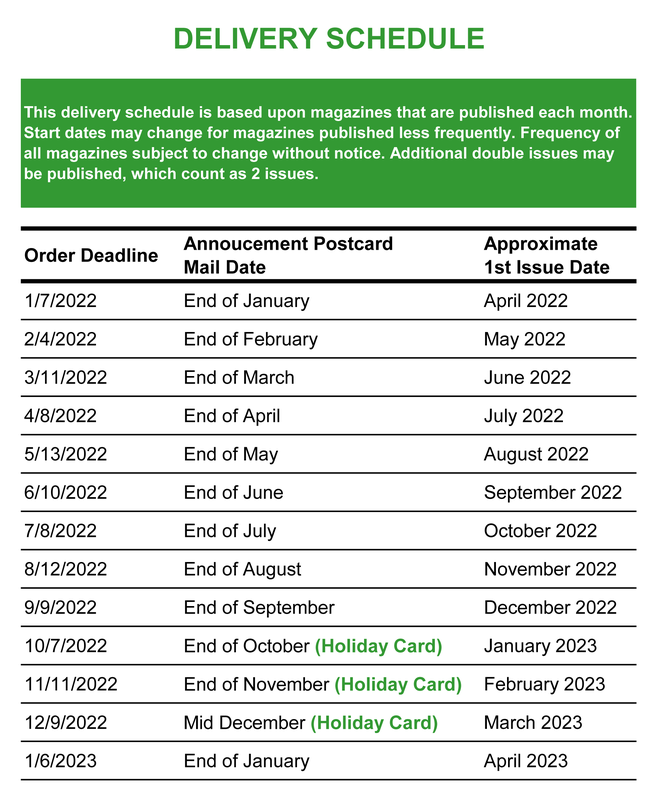 Start dates may change for magazines published less frequently. Sign in to your account and go to "Order History". Find the order you would like to check the status for and look up the column called "Order date/ Last issue". If the "Last issue" column has no data, please contact us for details. 11. How do I cancel a personalized gift subscription? You may cancel an order without being charged until the time the order is sent to the publisher. Sign in to your account and go to "Order History". Find the order you would like to cancel and click “cancel”. If the "cancel" link is not available, it's too late to cancel the order online. If you still wish to cancel this order, please email us and include magazine title, recipient name and address. 12. How do I change an address on a subscription? Sign in to your account and go to "Order History". Find the order you would like to change the address for and click "edit". Submit the address change by clicking the "Update Order" button. If the "edit" link is not available, please email us and include magazine title, recipient name, old and new address. We will be happy to make the changes for you. 13. How do I change a magazine title? You may change the title of the magazine online if the order has not been submitted to the publisher. Sign in to your account and go to "Order History". Find the order you would like to change and click “edit”. To save changes, click on "Update Order". Title changes are not permitted once orders have been processed. If you wish to cancel this order, please email us and include magazine title, recipient name and address. 14. What if my client is already a subscriber to the magazine I ordered for them? If your client is already a subscriber to the magazine you ordered for them, their current subscription will continue. Your client will receive a postcard to announce your personalized gift subscription. Your personalized gift subscription will start as soon as their current subscription expires. 15. How do I add my logo to my account? Logos Specs: 300 dpi resolution, EPS, JPG, TIF, PDF. We will contact you when your logo has been added to your account. You will receive an email reminder of orders subject for renewal in 90 days prior to their expiration. You will have the option to renew your clients’ personalized gift subscriptions or let them expire. We do not automatically renew subscriptions. We do not solicit your client for renewal. We do not sell, rent or otherwise "pander" your clients. And we do not sell or rent your contact information.